Today I learned a new word – Scruffing. Although I’m familiar with the action, didn’t know that’s what it’s called. Scruffing is used by mama cats to discipline their youngsters who become unruly. But it’s important to know if and when it’s appropriate to scruff your cat and how to do it without angering your cat. Scruffing should only be used when behavior is extremely grievous such as escalated aggression or misdirected aggression. Here’s how to scruff. 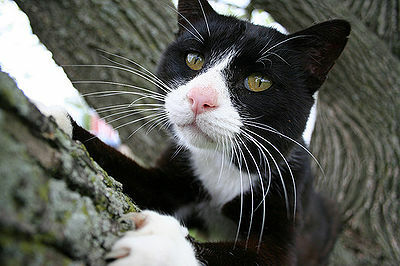 Grasp the scruff – the loose skin at the top of the neck of the cat. Use a firm but not rough grip. Press the cat down to the floor, again not roughly, and say a sharp “NO!”. You can also make a hissing sound as mama cat would. 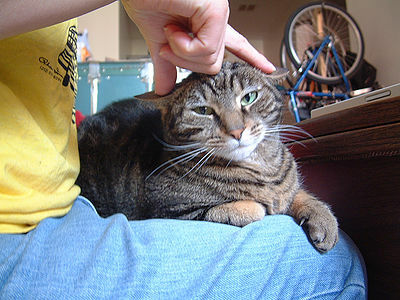 Hold the cat in this position until you feel his/her body relax, all the while telling your cat softly how good s/he is. The cat usually relaxes within a minute, but in some cases, can take up to 4 or 5 minutes. Release the cat telling him/her how good s/he is. Cats’ aggression is often motivated by jealousy, so punishment is not the answer. Punishment should not be used in most instances. 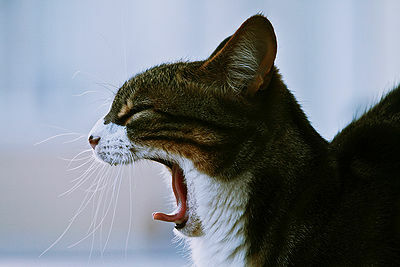 Redirected aggression occurs when your cat is angry or excited about something and lashes out at another cat or you. Often hissing as mother cats do will be effective. If 2 cats are in a furious fight, never attempt to separate them using your hands or your body as you will likely be scratched or bitten. You might try to remove the less aggressive cat, but still may wind up with scratches. One of the best ways to stop a cat fight is to startle the cats by throwing a pillow or towel or soft toy at them. Then you or a family member can grab the lesser aggressor and take him/her out of sight while you scruff the aggressor. Keep the cats separated for the rest of the day until tempers have calmed. Keep a close watch on them when things return to normal and they are back together again. When scruffing the adult cat, never pick the cat up high without supporting the cat by placing your other hand under the body. Remember to use scruffing only in harmful situations where injuries can occur. Hopefully, after a day of separation, your cats will behave as though nothing happened and be friendly, if not good friends.